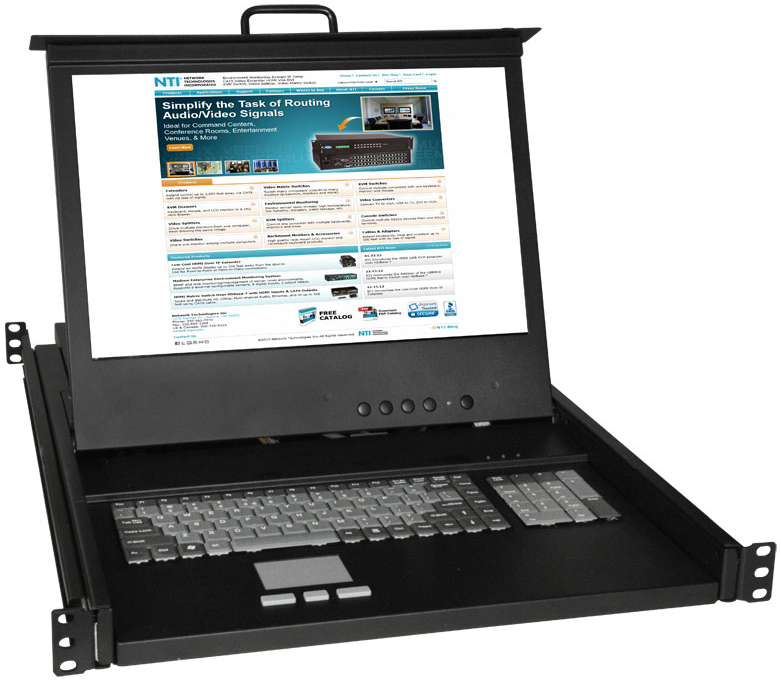 The RACKMUX® USB + PS/2 KVM Drawer combines a rackmount LCD monitor, keyboard, touchpad mouse in a space-saving 1RU industrial strength drawer. It is available with a 1920x1200 17.1" LCD, 1280x1024 17" LCD or 1024x768 15" LCD. Also known as: usb kvm drawer, rack mount PS/2 keyboard drawer, rack mount kvm drawer, USB console drawer, keyboard monitor touchpad mouse drawer, KVM drawers, keyboard LCD drawer, folding VGA monitor. The RACKMUX® VGA USB + PS/2 KVM Drawer combines a rackmount LCD monitor, keyboard, and touchpad mouse in a space-saving 1RU industrial strength drawer. Available with 15" or 17" Active Matrix LCD flat panel VGA monitor. Optional high resolution 1920x1200 WUXGA 17.1" monitor available. Compatible with USB and PS/2 computers. Available with 17-key numeric keypad or large padded wrist-rest. Front quick-release latches for pushing the drawer back into the rack. Available with optional 24VDC power. 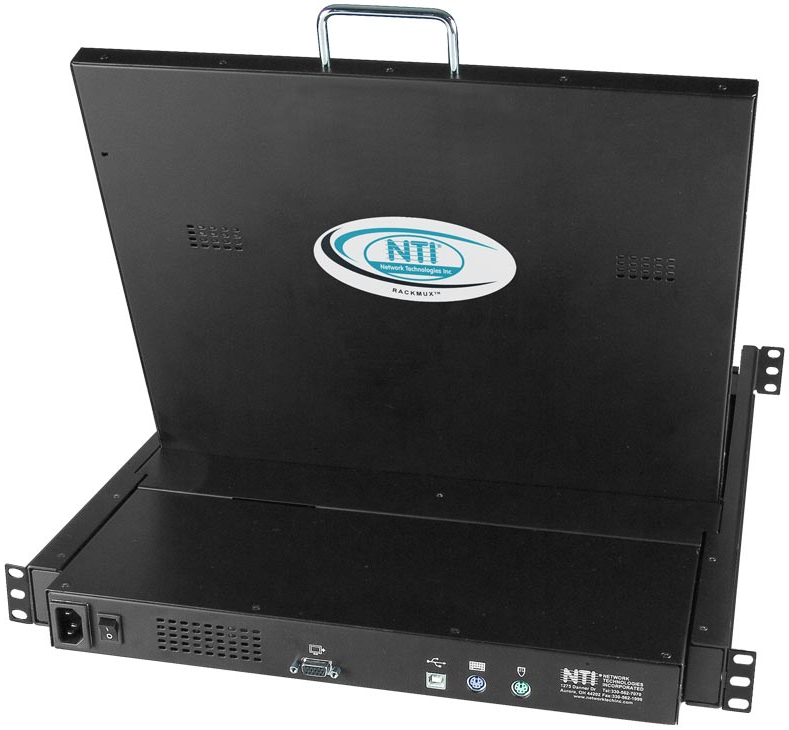 Available with optional mounting bracket for two-post style telco rack. Compatible with PS/2, UNIX and USB computers. One female 15-pin HD, one female USB Type B, and two female 6-pin minDIN connectors. Forward-folding 15" or 17" Active Matrix TFT LCD flat panel VGA monitor. Vertical: 55 to 76 Hz. 6-foot (1.8-meter) 15-pin HD VGA male to male cable included. 6-foot (1.8-meter) power supply cable included (not included with 24V option). Keyboard available in: English (US). RACKMUX-V15/V17: 83-key (US) keyboard with wrist-pad. RACKMUX-V15-N, RACKMUX-V17-N, RACKMUX-V17HR-N(-24V): 100-key (US) keyboard with numeric keypad. 110 or 220 VAC at 50 or 60 Hz via IEC connector. Operating temperature: 32 to 104°F (0 to 40°C). Handle adds an additional 1.5" (38 mm) to the depth when monitor is in closed position. Configuration and cable illustration of VGA USB + PS/2 KVM Drawer on how to provide space-saving convenient control. "I love the RACKMUX-V17-N rackmount KVM drawer that I ordered. It works great!"